This vanity is a great way to add modern style to your bathroom. Bring a classic look and feel to your bathroom with this beautiful set from Wyndham Collection. 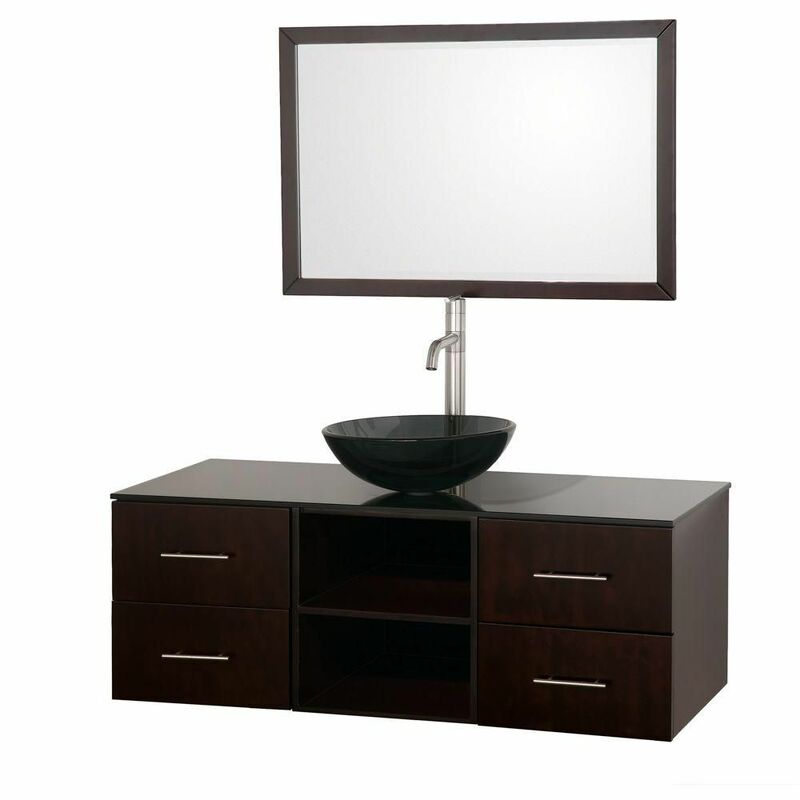 This vanity has both an all-around look and a modern style. Its beautiful white artificial stone counter and brown fiberboard base bring a great new look into your bathroom. Make your bathroom look like new with this good-looking, useful set from Wyndham Collection. Use this vanity to bring more modern style into your bathroom. Keep many bathroom items in its roomy drawers and double-door cabinet. Put a nice twist on your bathroom project with this classic piece from Wyndham Collection. For some added modern style in your bathroom, choose this beautiful vanity. The simple look of the single-door cabinet and drawer is useful and classic. Put together your perfect bathroom with this stylish vanity set from Wyndham Collection. Abba 48-inch W 4-Drawer Wall Mounted Vanity in Brown With Top in Black With Mirror This vanity is a great way to add modern style to your bathroom. Bring a classic look and feel to your bathroom with this beautiful set from Wyndham Collection. Abba 48-inch W 4-Drawer Wall Mounted Vanity in Brown With Top in Black With Mirror is rated 5.0 out of 5 by 1. Rated 5 out of 5 by spartycat from This is a beautiful vanity! We have had this for three years, and it is holding up great with no ... This is a beautiful vanity! We have had this for three years, and it is holding up great with no issues. The drawers are spacious, the open centers work well and look great with baskets. I added baskets below the vanity, and it looks great! The only drawbacks for me is that the glass countertop and bowl get dirty easy - that isn't something I considered before. The sink also drains slowly, but I can look past that. Overall, this is a great vanity at a great price!